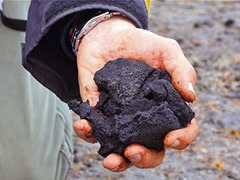 Petroleum coke or “petcoke” is a heavily carbon-based solid that is derived from the process of oil refinery. Many large oil companies use the substance to help power large facilities such as power plants. Unfortunately, many of these companies do a poor job of storing the powdery substance, and in cities such as Chicago, airborne petcoke has proven to be a significant health hazard for residents who live near petcoke storage facilities. Petcoke is often stored in large mounds out in the open air, causing dust-like residue from the substance to contaminate the environment. The petcoke residue causes health issues like coughing, wheezing, and shortness of breath. Experts also warn that the substance can exacerbate existing health conditions such as asthma. Controversy has been brewing around petcoke in Chicago, where oil giant BP recently increased its importation of the substance from a nearby refinery in Whiting, Indiana. The refinery also happens to be the same one responsible for the Lake Michigan oil spill in late March, meaning tension surrounding the company in those regions is already running high. Meanwhile, the City of Chicago and its mayor, Rahm Emanuel, have come under fire for modifying a proposed ordinance that would ban new petcoke facilities from opening in the city, as well as limit the expansion of existing facilities. Emanuel’s administration decided to include an apparent loophole in the ordinance that will allow facilities to house petcoke so long as it is burned for fuel onsite. A spokesperson for Emanuel asserted that banning the substance entirely would damage the potential for growing businesses that responsibly use petcoke in their manufacturing process. However, This softening on the city’s stance on petcoke sent environmentalists in an uproar. It seems at least for now, Chicago’s petcoke problem is here to stay.